August 28, 2014, 9:15 PM · ICYMI: Part One and Part Two. 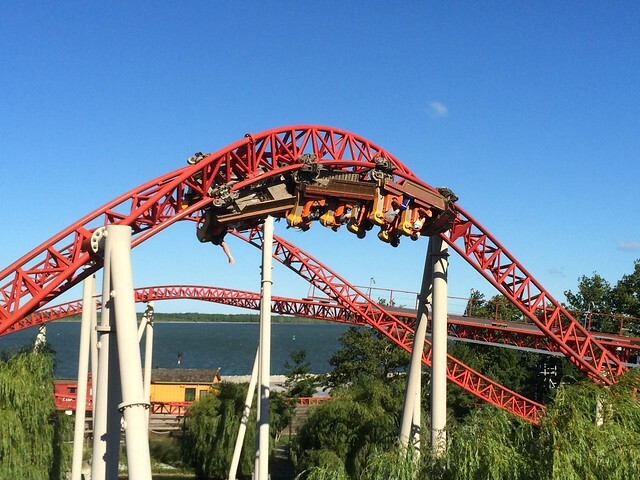 We are in Sandusky at a Fairfield Inn about six miles from Cedar Point – the Roller Coast! The room is nice, but much smaller than the Comfort Suites near Kings Island. Gonna be a bit cramped, but we’ll be fine. The pool is nicer, but there is no whirlpool, and the exercise room is small, really a one or two person closet to be honest. We likely will not be using the pool much as The Point is open until 10 PM the next couple of days, and there is a special Platinum Pass Holder night time ride event on Gatekeeper after park closing on August 13th. We came here to ride coasters, not swim! Let’s get unpacked and go check out the park! More when we get back from the park. As we drove across the Kinzel Causeway the jaws of the Rao Family collectively dropped as the behemoth that is Cedar Point rose powerfully into view. Stunning. Picturesque. Massive. The Point is all those things and more. It is something that should be seen with your own eyes as photographs just don't do it justice. Coasters and massively tall flat rides seemingly rise out of the depths of the water like sea monsters ready to lash out at unsuspecting and unprepared travelers. If Kings Island is big and in your face, which it is, Cedar Point is even bigger and even more in your face. It was chilly, around 73 degrees, and windy, very windy. Top Thrill Dragster had already closed due to high winds, which was okay by me because I was here for two things: Maverick (the coaster at Cedar Point I most wanted to ride) and a night ride on Millennium Force. So, we trekked about fourteen miles to the back of the park (Cedar Point is long, very long, Epcot long) to ride Maverick (yes, I know about the Soak City entrance, but this first visit I wanted to walk the park at night, and really see it in all its gloriously brilliant grandeur). Maverick had a posted wait of 15 minutes, but there was no line, so we whisked our way into the station and into the back three seats of the train. And we were off! What a ride!!! Wow! From the fast rising lift hill to the final launch, Maverick is definitely a ride that lives up to expectations. That first drop is amazing as you are flung out of your seat, and race recklessly through the rest of the twisted course, with the nearby bay on your left-hand side. And I remember yelling “Wait for it! Wait for it!” to my family as we slowed in the tunnel prepping for the launch halfway through the ride. What an exhilarating experience. I had high hopes but Maverick still managed to impress me. Sharing high-fives, and a chorus of “Awesome”s we exited through the gift shop with broad, jubilant smiles on our faces, and, laughing, we headed towards our next adventure. Our mission for the night was accomplished and it was nearing closing time, so we headed to the main entrance. On our way out we noticed that Raptor had absolutely no line. So with about ten minutes to go before park closing, we hopped on and got to ride a couple times in a row without exiting. Raptor is a good B&M invert, with some real nice elements, but after Banshee, nothing will ever be as good. I did like the helix at the end of the ride as it puts some massive pressure on you, but overall Banshee is just a far better experience. Raptor is good, a bit rough for a B&M invert, but good. I am just spoiled now! After a couple rides on Raptor the park was closing up so we headed back to the hotel, and stopped for a quick bite to eat at Taco Bell (yeah, a horrible choice, I know, but all we really had time for at 10:30pm). Everyone is now sleeping as I put the final touches on today’s report. I’m exhausted, but excited for tomorrow. We’ll be meeting fellow TPI regular James Koehl and his son Anton for early entry at 9am. I am definitely looking forward to continuing our Ohio adventures, but for now, rest is required! Night, night…. There is a line in the musical Big River that asks, “Did the morning come too early or was the night not long enough?” It is a fitting question to ask as I wearily start waking kids up at the crack of dawn. It is going to be a chilly morning in Sandusky, but I convince myself that coaster lovers have an inner heat that defies cold weather. “We will be just fine,” I think, as my cheerful calls to rise and shine are met with grumbles and angst. “We’re leaving at 8am, kiddos, time to rock and roller coast!” More groans (deservedly so). I pull out my ace: “Top Thrill Dragster awaits!” And suddenly the light comes on, both literally and figuratively, as the sun breaks through the clouds and the kids remember exactly where we are. Abruptly everyone is in a rush to get ready. It is going to be a great day…. What a day it was! Sure it had its share of ups and downs (pun intended) but it hit the finish line strong! While the previous night’s activities showcased the grandeur of the park, the warts showed quite clearly in the light of day. Cedar Point is not the amusement park mecca we first thought, though its reputation would have you believe it is so. By count there are about 50 non-kiddie rides in the park. A lot, but since they are all largely limited capacity attractions, coasters, flats, and swings, when the big crowds hit, the place becomes really tricky to navigate. Long lines form quickly at the headliner attractions, and eventually even the mid-tier and flat rides back up to the point of silliness. Fast Lane and Fast Lane Plus both sell out regularly at Cedar Point, but at $480 for my group of six, it wasn’t an option. Cedar Point is definitely not a park for people who are impatient or who want to avoid crowds and long waits. 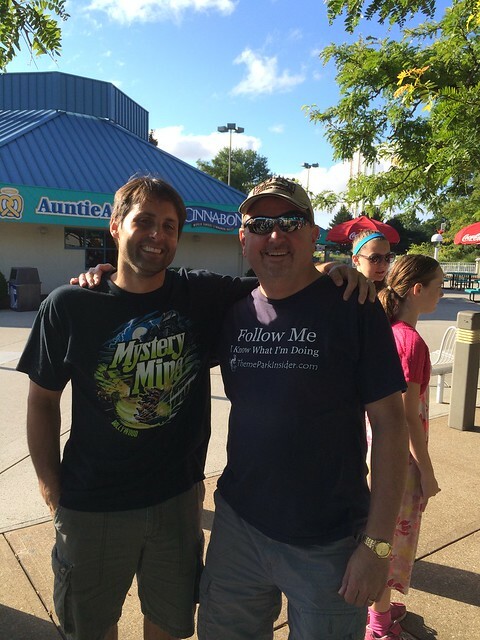 We met fellow TPI member James (Jim) Koehl and his son Anton at the Soak City entrance of the park. Jim, wearing his coveted Theme Park Insider T-shirt, regaled us with stories of Cedar Point past, present, and future both days that we toured with him and his son. And it was the history of Cedar Point that interested me most, as I quickly became a huge fan of the park that once was much more than its present incarnation. Please don’t get me wrong, there is plenty of fun to be had at the current day version of Cedar Point, but Jim’s whimsical and romanticized tales of its glorious past intrigued me in a way I am intrigued by classic parks like Disneyland and the 1980’s version of Epcot. I asked Jim repeatedly to provide TPI with these historical vignettes as I believe other theme park fans would be hugely interested in the history of this grand old amusement park. We’ll see if he follows through…. Since we all had Platinum passes we were able to enter the park one hour early (with the on-site-resort guests) and grab some Early Ride Time on select coasters. Our first target was Maverick, so at 9 we blasted through the entrance and headed right toward Frontier Town and progressed to the front seat of Maverick without a wait. As I stated last night, Maverick is a great coaster, packing a wallop of elements into a beautiful layout. Yes, the restraints could be better and occasionally they can hurt your thighs, but not enough to detract from the overall experience of this stellar ride. I hate to kill the suspense, but I will state now that Maverick was my favorite coaster at Cedar Point, and I have the T-shirt to prove it! We rode Maverick a few times until about 9:40 when the constant stream of early arrivals caused the wait to grow beyond a few minutes. We headed in the general direction of Top Thrill Dragster to get in line for its 10am opening. Sadly, other people had the same idea and the line already stretched beyond what I was expecting. Furthermore, this headliner was not even testing yet as high winds delayed its opening. In fact, when the ride finally did open later that morning the waits quickly spiraled to over two hours as the back two rows were blocked off making an already low capacity attraction even worse. We moved on to other experiences. First up we hit Iron Dragon which is a suspended coaster like the Bat at Kings Island. Unlike the Bat, however, Iron Dragon is a slow, meandering ride that provides some nice scenery but almost no thrills at all. It does make for a good starter coaster, and the second half of the ride is a bit peppier, but we expected a bit more from the Roller Coast. 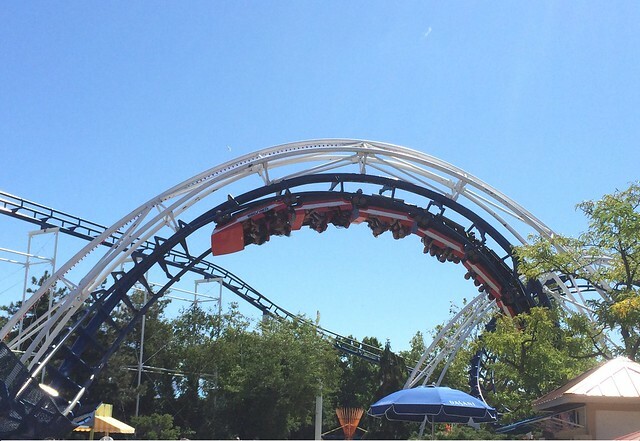 Next up was Mantis, a B&M standup rumored to be changing significantly next year (2015). We actually enjoyed this coaster and visited it several times throughout the day. It has a long course with a variety of fun elements that combine for a thrilling ride. As long as you remember to crouch slightly right before they lock you into position (in effect giving you a bit more room to stand) you won't experience the discomfort that usually comes with these types of rides. After Mantis, we sauntered through Frontier Trail and Frontier Town where Jim entertained us with stories of what was and what could still be. This area is the only themed section of Cedar Point and as I told Jim it is very similar to Silver Dollar City, without the great food and top-notch shows (although we will probably catch the Red Garter Saloon show tomorrow). If you follow the Theme Park Insider Blog Flume regularly, Jim posted an excellent article about the history of Frontier Trail/Town, so you already know a lot about the area. Suffice it to say that Cedar Point has an under-utilized and under-appreciated themed area at the park, so let's hope Matt Ouimet recognizes its potential and expands the adventures in the area at some point in the future. Jim had never been on Skyhawk, an S&S swing ride, and so we boarded and rode it next. I think this attraction is the same as the one at Silver Dollar City, but my kids kept telling me it went higher. I am not sure that statement is true, but it is a good ride, though too short, if you ask me. Both the Cedar Creek Mine Ride and Mean Streak were on a staggered schedule, not opening until 11, so we headed to Gemini next. Only the red training was running, but there was no line so we quickly boarded and rode. Without the hand-slapping good fun that comes with both trains running at the same time, Gemini is a fairly tame and boring ride, and it is a bit on the painful side. The blue side did open later (around 11:30) and we did get to experience the hand-slapping good fun of a family racing coaster done right. Gemini is not worth riding unless the two trains are racing, IMHO. Next we passed through the recently reimagined Gemini Midway, which looks nice and has quite a bit of kinetic energy, and moved on to Magnum XL-200. Great ride. Really great. This coaster quickly became one of my favorites at the park. Good speed, good air, great views, and a fast moving line make for a terrific coaster experience. Honestly, I might even prefer Magnum over Millennium Force, but I am not sure I am ready to make that statement yet. Need to ride Force again before I decide. From Magnum we rode Corkscrew which may have had some merit in the past, and does provide some great views along the midway, but the ride is just “meh”. A one-and-done coaster for us. At this point it was starting to get very crowded. Honestly it felt a bit like Disneyland with crammed walkways and people bumping into each other every step of the way. One thing to note is that as you walk the midways at Cedar Point most folks are generally craning their necks this way and that way looking at the various coasters as they make their rounds. It is not uncommon to crash into folks due to this phenomenon. My advice to you: act like you’ve been there and keep your eyes forward. If you must stop and gawk at Top Thrill Dragster, then pull over to the side of the midway and gawk. Don’t keep walking without looking where you are going! Common courtesy, folks! We grabbed a ride on a couple of midway flats, Super Himalaya and Matterhorn, which could use a thorough cleaning and some fresh paint. Still, as far as flats go, these two are a couple of my favorites, and since the lines were short, why not? However, I should inform you that much like my local Cedar Fair Park, Worlds of Fun, these flats were staffed by a single ride operator. So the same person that lets you board, has to make sure you are locked in, and also has to start the ride. Cycle rides are notoriously slow loaders anyway, but with only one ride op they become so much worse. I hate to wait for an employee to slowly meander through their duties while I am sweating my rear end off in an uncovered, short line. Come on, Cedar Point, staff up your rides! This comment brings me to an observation about Cedar Point: for as busy as the park is, the employee presence seems way too low. In comparison to Kings Island, where employees were prevalent and highly visible every step of the way, Cedar Point seems like an employee ghost town. Seldom did we see “cast members” wandering around sweeping or staffing the entrance of queue lines, and there were a good number of times we encountered attractions with only one person performing the operations. In short, the park seemed understaffed. Maybe it was just an unexpectedly busy couple of days, but we found the employee presence at Kings Island to be better than Cedar Point, and thus our overall customer experience at Kings Island was superior. However, we did have Mr. Koehl in our party which was like having a VIP tour, so we still had a great visit! After the Matterhorn we wanted to hop on the sky ride, but again, due to high winds, it was not operating. And it was also at this time that we noted GateKeeper was not operating, and that in fact a large crane was lifting something to the top of the lift hill. Uh oh, our Platinum Pass Holder Evening Ride Time was scheduled to be on GateKeeper! Cursing myself for not riding this wing coaster the previous night instead of Raptor, I trudged with the rest of the group to the front of the park to get lunch. August 28, 2014 at 10:37 PM · The Cedar Point of 60s/70s/80s was indeed loaded with considerable character and charm. Traces of that still remain, of course, and many are hopeful that the Ouimet era will bring some of that back. The improvements to Frontier Trail alone (the improved Barnyard, live music, "streetmosphere" characters, the Trail Tavern theme-appropriate area music) are huge steps in the right direction. August 29, 2014 at 2:48 AM · Sounds like Raptor hasn't improved since the last time I was at CP. When it was new it was as smooth as sliding down a perfect water slide. Fast, not jarring and fun. Someone seemed to slowly turn off the water though and it got worse over the years. August 29, 2014 at 5:42 AM · I hope you're right, Tim, because Cedar Point could truly become the bridge between theme and thrills offering the best of both worlds if they tried. 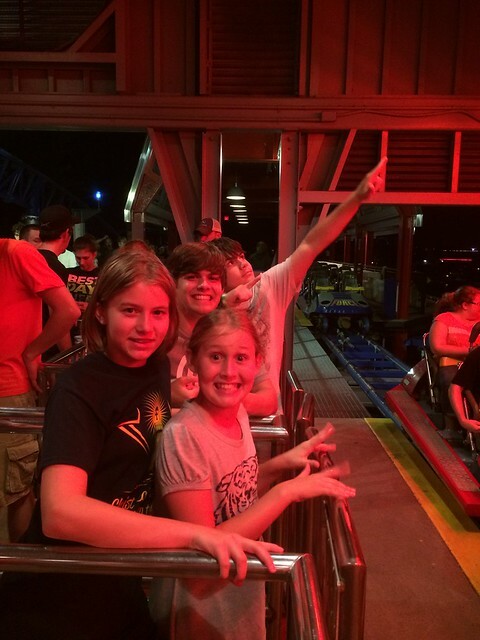 And Eric, don't get me wrong, Raptor is still a good coaster, just not Banshee good! August 29, 2014 at 8:48 AM · A coaster fan's first drive across the causeway is like the Stairway to Heaven, especially with Gatekeeper dominating the new entry plaza. I remember our first drive there in Dragster's first season and seeing the roller coaster equivalent to the Taj Mahal from US 6 by the municipal airport. It was like a giant beacon to a fanaticism that is difficult to explain to those who lack a craving for everything roller coasters. I do think that Cedar Point is really missing out on guests by not delivering a more themed environment. Does building another slow-loading flat ride really bring a return on investment? I would doubt that, so why not take some of that money, and put it towards pushing more intricate theming to some of the more devoid sections of the park. Everyone knows they can do it, TTD was lauded for it theme but aside from the immediate area around the coaster, where is the racing theme---it could easily be extended to the nearby flat rides and Corkscrew, and even Draggin Iron if they wanted. Even Maverick, which is one of Cedar Point's most themed coaster, could use a bit more with tunnel effects that no longer work consistently. Cedar Fair's new idea of theme is to put a statue at the entrance of the ride with pretty brick pavers all around. Fanboys will come no matter what, but Cedar Point could really capitalize on families, who are now spending more time in local indoor waterparks, if theme was better integrated around the park. August 29, 2014 at 2:57 PM · Yeah, Cedar Point is lacking in theming, but as they've always promoted themselves as an "amusement park" rather than a "theme park" I give them a pass for it. There are people who will defend Cedar Point to the death as the best park in the world. I disagree, and instead consider it the best thrill park, as I definitely think places like Disneyland and Busch Gardens are better parks when not only discussing rides. Cedar Point is a great park with a good collection of attractions, but there are definitely individual rides that will beat most of the ones at Cedar Point. Maverick is spectacular, Top Thrill Dragster is short but excellent, Millennium Force is a top tier ride as well, but other than those three Cedar Point's coasters tend to range from good to worthless. Raptor is the only other one I might consider a stand-out (though it is kind of the worst of the best compared to other inverted coasters, if that makes any sense). Can't wait to see the conclusion of the report. I'll have to see how your coaster preferences line up with mine again. August 29, 2014 at 3:58 PM · AJ, I don't expect Cedar Fair to unseat Disney and provide the best theme parks in the world. They don't have the money or the wherewithal to accomplish such a feat. I am looking at Cedar Fair, across all their parks, to provide more decorative touches rather than the immersive narrative that Disney does so well. Specifically, though, Cedar Point could certainly be that park that mixes thrills and theme to the best extent giving folks a good taste of both worlds. Right now I think parks like Silver Dollar City, Dollywood, and even Busch Gardens Williamsburg (though it has been a few years since I visited) do a better job of hitting that middle ground than Cedar Point. But the self proclaimed greatest amusement park in the world has everything it needs to be the best: amazing location, great rides, a storied history, and a perfect setting. Cedar Fair and Matt Ouimet just need to take that next step and grow the park to be more than just the biggest regional park in the US. @Russell "Draggin Iron" - too funny. And a perfect name for that coaster. August 29, 2014 at 7:40 PM · James - I get that. Its an older coaster so I expect it to be surpassed by now. 18 years old now in fact. Just mentioning that it once was better than it is now. CP may not be the best at a lot of things. There are certainly better themed parks (just about anywhere), and certainly better individual rides (Banshee). Its strength lies in having so much in one place. That is what makes it special. Yes I like to defend it because it was my home park for many many years. Growing up three hours away in the 80's made it a twice a year trip. I have been to my fair share of other parks though and still feel that way. And as much as I like to defend it...Iron Drag-on and the Mine Ride need to go, Corkscrew is kept around only for nostalgia, and they should consider replacing Mean Streak. 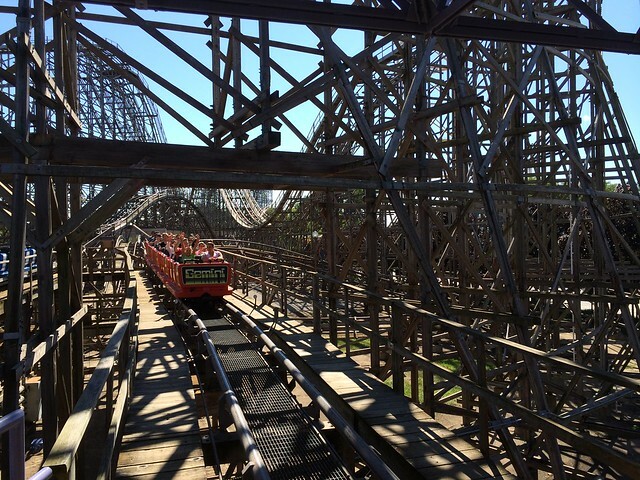 They basically killed Mean Streak when they added the trim brake on the first hill. 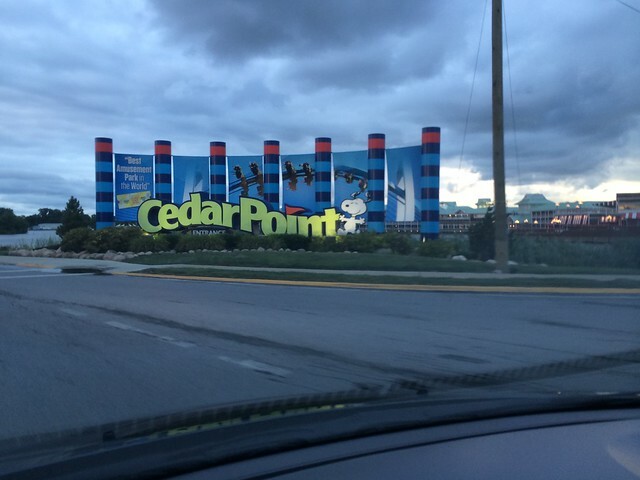 August 29, 2014 at 7:54 PM · Eric, you won't have to defend Cedar Point against me, I assure you. It is a fine park. You'll see that I do offer some fair criticism over the next two parts of the trip report, but also a lot of praise. I do think Cedar Point can be much more than it is today, and think it is headed in the right direction, but if it was my home park, I would be quite pleased - except for the long lines. August 29, 2014 at 8:59 PM · Yes, the summer lines are really long. Back when I enjoyed coasters more than I now do, I was lucky to get in six to eight rides in a day. Lots of close to 2 hour coaster lines. Those that complain about 2 to 3 hour waits on Gringotts would really have problems at CP where the good coasters are almost always really long waits for regular stand by, short of the early morning. But it still is a very beautiful park, though I miss the old time theming from my earlier years there. The view, scent & sounds of the lake are memorable. But yes, it is an amusement park, not close to being a theme park. August 29, 2014 at 9:56 PM · No apologies necessary, Eric, I just wanted to make sure you knew I wasn't trying to knock your home park. Besides Mr. Koehl was constantly grinding my gears every time I said anything remotely negative. Cedar Point is definitely beloved among its local fans! Rob, we got in a lot of rides, but it definitely took some planning and perseverance to avoid those extreme waits, that's for sure.